This workshop is part of the Muriwai Arts Group Show ‘Connect’ and the Muriwai Arts Open Studios on the 5-7 April 2019. Sharing, caring, creating. Views on local nature and experience. During their workshop, Benjamin Gibert and Thomas Vaillant (respectively musician and photographer/videographer from France) will present their work, and they will explain how their personal productions and artistic research, in their own fields, influenced and shaped what they produced together. Benjamin will talk about the way he finds connections between human behavior and natural structures and how he transforms it into music. Thomas explores the visual possibilities of what nature offers. One particular interest lays in towards how nature reaffirms itself in places that have been once colonized by men. Always putting themselves as observers rather than creators, Thomas and Benjamin like to sit, listen, watch, and record, as they find their common process into empiricism. As observers, they came to New Zealand trying to keep a spirit free of preconceived ideas about the country or the cultures. They have collected data and insights along their way to Muriwai and will keep doing so during their residency. They both want locals to be involved in their creative work. Therefore, they would like to include the visitors into this process during the workshop. People interested in being part of it will have the occasion to be recorded by Benjamin, to create music through sounds and singing (visitors are encouraged to bring any sound making objects, songs, or anything musical). Thomas will have some questions prepared for visitors willing to share their insight on culture, nature, and spirituality, through his lens. As part of the process, this would lead to a filmed discussion. Parts of it is to be used for the video, and all of it will help them seize an idea of the local cultures and views. Afternoon tea will conclude the gathering, so please bring a plate. 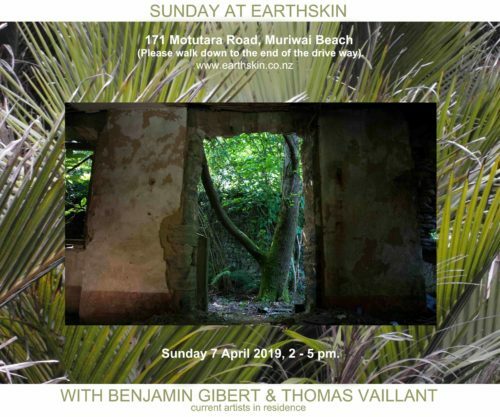 It will be held at Earthskin (171 Motutara Road, Muriwai) on Sunday 7 April 2019, 2 – 5pm. Please walk down to the end of the drive way (no car park available). SUNDAY AT EARTHSKIN Earthskin Residents will be offering free community workshops on last Sunday of most months. Everyone is welcome to join.